and many entries in her diaries (1937-1943) describe her adventures going to this haven of painting, sculpture, and personal encounters. I have walked downtown and back today—about eight miles I guess and, oh, it’s so lovely out. Glorious you know—full flush of spring—tulips at their brightest—blossoming red and purples startingly vivid on the green. Sky as blue as ever could be and lake as blue-green—as—as—as—as, well, as the lake. Lilac bushes shedding loveliness and the pool in the park just covered with floating fallen petals. Bright-haired children reaching up to sniff vivid flowers or racing around ’plashing fonts in the park. (Excuse me if I get poetical—I walked eight miles). Lovely Goddess of the Waters pouring from her shell onto the sister lakes with nymphs sporting on the side. 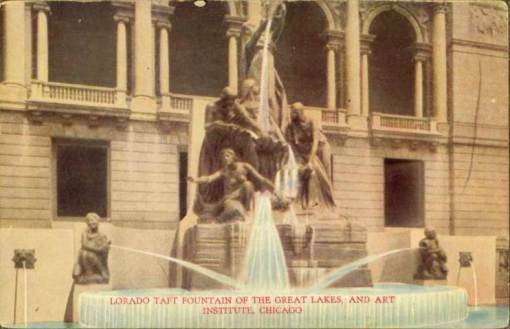 Fountain of the Great Lakes. 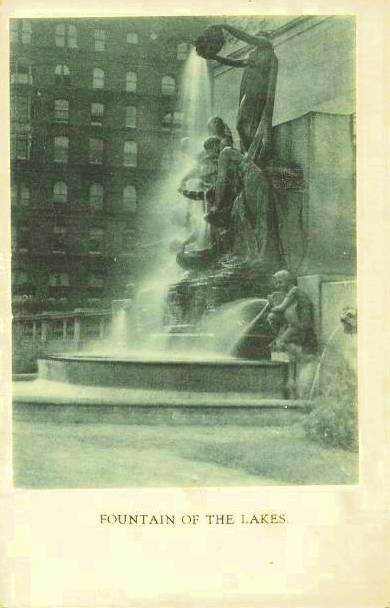 Here is Joan’s own sketch of the Fountain of the Great Lakes from her diary that day. A year later, when she is 15, Joan describes the following adventure, an encounter with a piece of modern art. This is Wotan’s Day. In the morning I went to that place to get X-rays taken for T.B. Met a graduated senior from Lake View there, Vernon Cowan. He reads [P. G.] Wodehouse, too. He said he’d call me up tomorrow, but I didn’t give him my telephone number. I wonder how my insides look in the X-ray. I wanted to take it home but they wouldn’t even let me see it. It was very awkward—a big machine and then they snap the picture. Modern art [Salvador Dalí]. There was a curly blonde fellow sitting next to me. We both considered the picture for a long time. Then I got up to look again to see I wasn’t crazy. I sat down. He got up. Ditto. We looked at each other. A woman came into the room, looked at the picture and started back (it has that effect). Then, thinking we were together, she started to discuss the picture with C.B. [Curly Blonde] and me. No decision, though we nodded solemnly. I was thinking about Joan’s experience with Modern Art at the news that about 1,400 works of art lost since World War II have been rediscovered in an apartment in Munich. You can read about that tangled history here. Stolen by the Nazis, this art was considered “degenerate” and hence unacceptable. Yet secretly Nazi officials had a dealer steal this art from rightful owners — museums and Jews, including some deported “to the Lodz ghetto”. According to Spiegel, the artworks include “works by Liebermann, Marc Chagall, Franz Marc, Karl Schmidt-Rottluff, Max Beckmann, Emil Nolde, Picasso and Henri Matisse,” among others. You can watch this news report about the discovery of these artworks. Here are some images of the uncovered art. 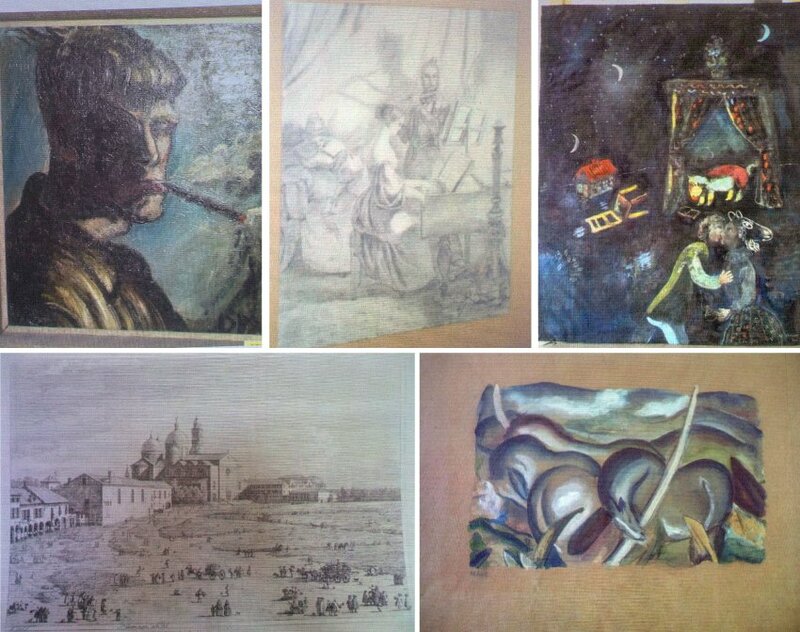 A sampling of works from the spectacular Munich find, clockwise from top left: An unknown self-portrait by Otto Dix thought to date to 1919, a Biedermeier-style etching of a couple playing music by Carl Spitzweg (1808-1885), a painting by Belarusian-French artist Marc Chagall (1887-1985), an etching of Padua by the Italian painter Canaletto (1697-1768) and “Landscape with Horses” by German painter Franz Marc. From the Spiegel article noted in this post. 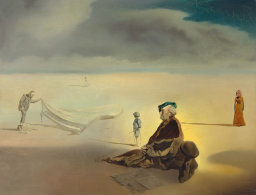 I imagine that the Dali painting Joan puzzled over would have been considered “degenerate”–after all, it has Goethe in a mysteriously surreal landscape. How sad that art should be to humiliate, control, and abuse people. As Joan writes on March 9, 1939 when she is 16 years old, “An impressionist painter, when he draws a moving train, does not draw it as he sees it at one particular moment; he draws it as he sees it where he stands; he draws the impression, not the true thing. Instead of drawing each window with its shade and sash, he smears a blur of yellow light. This is so that when a person sees the picture he will not say, ‘That is a train,’ but ‘I have seen a train like that.’ That is good painting. 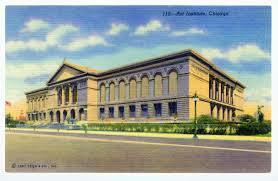 Posted in Susie's Blog and tagged Art Institute of Chicago, Degenerate Art, Joan, Munich, Nazi stolen art, Salvador Dali. Bookmark the permalink. I have been to Chicago many times,my husband took us to a lot of places. He lived in Chicago for six years and trained to be an Ophthalmologist. I like the city it is so large,yet it is beautiful. Yes, it is an amazing city! I think it helped make Joan more aware–politically and in terms of art due to all it offers.